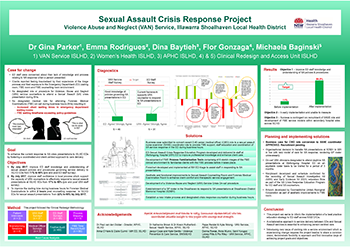 The Violence, Abuse and Neglect (VAN) Service developed integrated and cost-effective solutions to support clients who present to the emergency department (ED) at Wollongong Hospital following a sexual assault (SA). To improve ED staff knowledge and understanding of policies and procedures governing VAN Service delivery from 11% to 80% by July 2017. To improve VAN staff confidence in local processes from 17% to 80% by July 2017. To improve the number of forensic medical examinations (FME) conducted within two hours of SA counselling, from 22% to 80% by July 2017. Provides a coordinated and client-centred approach to care delivery. Reduces FME waiting time following SA counselling. Improves staff confidence, clinical skills and decision making. Improves client experience, engagement and knowledge of the VAN Service. Enhances clinical and corporate governance processes. Ensures that client information and care is managed in accordance with NSW Health policy and best practice. Provides tools that enhance the therapeutic environment and experience of clients presenting to the ED. In Australia, one in three SAs occur before the age of 15 and one in six women have experienced physical or sexual violence from a current or former partner1. In the 24 months prior to December 2015, there was a 29.5% increase in indecent assault and related offences across the Shoalhaven and Southern Highlighands2. There was also a 14.8% increase in SA incidents in the Illawarra during the 24-month period to March 20163. In 2015, there were 51 SA crisis presentations to Wollongong Hospital ED, with 43 FME performed. In Shoalhaven District Memorial Hospital, there were 19 SA crisis presentations to the ED, with 15 FME performed. These statistics demonstrate the need for a highly effective and systematic response to SA presentations at EDs in ISLHD. The VAN Service in ISLHD provides a 24/7 SA service for those presenting to EDs in the Illawarra or Shoalhaven regions. In July 2016, the following key issues were identified. There was no formal process for doctors attending FME, both during business hours and after hours using the on-call system. NSW Health policy states that the waiting time for an FME should be within two hours of SA counselling4. However, prior to the project’s inception, the waiting time was an average of 6-8 hours. Feedback from clients indicated that the extended waiting period between counselling and FME exacerbated their traumatic experience and often led to a ‘feeling of dirtiness of shame’ as they are unable to shower until an FME has been performed. There were also some clients who presented to the ED but decided to leave and not return, due to the extended waiting time. There was no designated process for VAN counsellors to attend a SA crisis presentation in the ED during business hours. Staff were allocated to this role on an ad hoc basis, which impacted their scheduled work commitments and resulted in cancellations of existing client appointments. This led to an increase in service costs, associated with the additional appointments required. A steering committee was established to monitor the progress of the project against its objectives and ensure it aligned with the ISLHD organisation strategy. A staff experience survey was conducted in September 2016 by 85 staff from across the VAN Service, including medical officers and general practitioners. As part of the diagnostics phase conducted between August and October 2016, five process mapping sessions were held with ED and VAN Service staff in addition to 64 FME time record audits, seven brainstorming sessions, three client interviews, a root cause analysis and data analysis from staff surveys. An SA education and training strategy was developed for ED staff by VAN counsellors. Four one-hour face-to-face education sessions were attended by 28 ED staff between April and June 2017, covering SA legislation and policy, indicators of SA, management and response to SA presentations and triage process. A flowchart was developed and implemented in the ED to help staff triage SA clients and respond in a timely manner. A refurbishment of the VAN Service counselling room and FME clinical room was undertaken, to improve the comfort of clients while they wait. Walls were repainted, new furniture was purchased and three artworks were commissioned for both spaces. On-call VAN clinicians were designated to attend daytime SA presentations at Wollongong Hospital ED on an equitable roster basis. A formal business case was put forward to senior management for approval to convert the vacant 0.40 career medical officer role to a sexual assault nurse examiner role and is currently with the ISLHD finance department. This role will provide FME support, staff education and coordination of SA service response in the ED during business hours. Five images of the FME clinical environment were developed to familiarise clients with the space and guide them through the FME process, with the aim of alleviating anxiety and distress about the procedure. This tool was developed in direct response to feedback received during patient journeys in which clients said they would like to have been better informed and prepared for the FME process. Direct consultation with the project steering committee consumer representative informed the development of this tool from its inception and approval was provided for each final version. Sexual assault investigation kit and early evidence kit staff education films are being developed for the purpose of ongoing staff education and training. These training videos will support existing face-to-face SA education delivery to ED staff and will be made available via an ED intranet portal. a VAN staff survey to measure compliance with flowchart and on-call procedure. a survey to measure client satisfaction with the VAN Service and waiting areas. In a staff survey conducted between May and June 2017, 84.5% of staff indicated good, very good or excellent knowledge and understanding of SA policies and procedures, following education and training. Sponsorship support and management buy-in is crucial to the success and progression of any project. Introducing new ways of working into a service environment which is already undergoing significant transformation requires change agents to demonstrate very clearly the need for doing things differently. A strong case for change is essential. The voices of staff who work directly with clients need to be heard. Perseverance and commitment when up against resistance is key. Progress can be very slow when relying on external factors and can be out of your control. Australia’s National Research Organisation for Women’s Safety (ANROWS). Violence against women: key statistics. Sydney: ANROWS; 2017. Goh D, Ramsey S. New South Wales Recorded Crime Statistics 2015. Sydney: NSW Bureau of Crime Statistics and Research; 2016. NSW Bureau of Crime Statistics and Research. New South Wales Recorded Crime Statistics: March Quarter 2016. Sydney: NSW Bureau of Crime Statistics and Research; 2016. NSW Ministry of Health. Sexual Assault Services Policy and Procedure Manual (Adult). PD2005_607. North Sydney: NSW Health; 2005.